Help us make a difference and put a smile on someone's face – become a volunteer with Feros Care! We are seeking enthusiastic volunteers to become a part of our team and have a positive influence on the daily lives of our clients and residents at Feros Care. No qualifications are needed, we provide all our volunteers with an orientation so they are equipped with the knowledge and skills to be a Feros volunteer. You can volunteer in many different ways: in person in the community or at one of our residential villages, or virtually from your home via the internet or over the phone. The amount of time you can offer is up to you. Just a small amount of your time can help combat loneliness and isolation – not to mention that you will come out richer in knowledge, experiences, and friends. If you are caring and compassionate, enjoy meeting new people and forming meaningful new relationships, then you are meant for this! Why volunteer with Feros Care? The Community Visitor Scheme sets up Australian seniors living at home with likeminded individuals for social outings, fun home visits, or virtual communication via phone, tablet, or computer. Share your hobbies, interests and passion, have fun and meet new people, and share life experiences and activities like gardening, arts and crafts or cooking together. Provide companionship to seniors living in their homes and make new friends along the way. Another meaningful way to volunteer your time is by running, facilitating or presenting at our Virtual Senior Centre. We are always looking for story tellers, gourmet cooks, craft and language teachers, or people to host special interest chat sessions! These sessions can be done remotely, and the possibilities are only limited by your imagination. Interested in volunteering through the Community Visitor Scheme? Apply now. Residential volunteering is perfect if you are located near one of our three sites. Our residential villages at Bangalow, Byron Bay, and Wommin Bay are always on the lookout for enthusiastic volunteers to help out in fun, educational and exciting roles. Be part of village life, have a cup of tea with the residents, play a game of scrabble or take part in one of our events. Knowing our residents it could be anything from a bake off, silent disco, graffiti or a trip to the beach. Interested in volunteering at our residential villages? Apply now. Bryan & Kevin - Feros Care VolunteersTwo Feros Care volunteers take seniors on a day out. 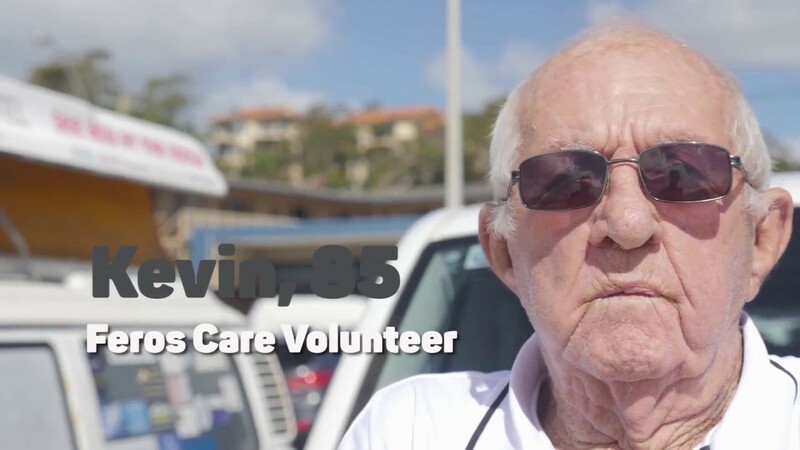 If you would like to volunteer please complete an online application or call us on 1300 090 256.